I've looked back over the thread on the 2013 recall. What's very different there is that a) Tern responsed promptly and regularly about the problem on the forum. This time, virtually nothing, other than the far from reassuring 'frame sometimes break' and b) there was a recall after 2 failures, this time nothing after 6 (?) failures. In this age, PR is a vital part of a company's sucess. Here we've seen a PR disaster, with more and more reports on the internet of Tern failures. Broken reputations can take a long time to repair. So what's happening? What's happened to the company? If we a) assume that Tern is actually investigating the problem and b) faulty welding is the problem, how long should this take to investigate? A fundemental design fault is always a possibility but hopefully less likely. I purely guessing but if this were the case, presumably there would be more failures across the range. Will there be any answers or will there have to a serious injury and court case to see any action? Do you have the link? It would be interesting to see... also would be good to report it here in the official forum. Apologies for the long post in advance, but I have tried to keep it as brief as possible. I posted here about my 6 month old Eclipse frame failing at the start of April. I have kept quiet on this forum as I have wanted to see how it pans out before making any comments and to wait for a resolution from Evans Cycles who are the UK distributors for Tern. In view of recent posts, I would like to share my experience and say to Tern that unless this is resolved soon, the likelihood of a rider being seriously hurt or killed increases with every failure and also say to UK riders that pressure should be put onto Evans Cycles, as they are responsible for the quality of the bicycles sold under UK laws. Before I sent my frame to Evans Cycles to begin the warranty process, I took the frame to be visually inspected by an independent authority. It was their opinion that the welding around the OCL joint was not of sufficient quality to ensure the integrity of the frame which lead to a catastrophic failure. My first impression of Evans Cycles was they were very slow to react and I only got a response from them once I chased them after a three day delay and receiving an email from them that was meant for internal purposes. I then had to chase them again to arrange a date for bringing the bike in for inspection. After they had received my frame, I got a response after seven working days. Evans Cycles findings were that although the bicycle was in generally good condition - I had failed to maintain the correct tension of the OCL joint and that riding the bicycle for "any amount of time" in this condition would lead to the failure of the frame - no mention was made to the quality of the weld, but they were very quick to say that the bike had not been supplied in defective condition, and I that had brought the bike in for the complimentary six week service (which I did not), the failure may not have occurred and that their PDI process would have insured that hinge was correctly adjusted on delivery. As a gesture of goodwill the offered me a new Eclipse or store credit to the cost thereof. I used the bike every working day and I know the hinge was snapping tightly shut. I replied asking for evidence, i.e. the exact tension that they measured on the hinge to lead them to the conclusion that it was too lose, what were their findings regarding the quality of the failed weld, to provide a definition of the ambiguous term "any amount of time", how the six week service could have prevented the frame failure and why there was no mention of the the OCL hinge tension in the PDI list that arrived with the bike. After chasing them again after another five working day wait, they did not provide any figures for the tension of the hinge, stated that they do not have necessary expertise to determine the quality of the welding, that trying to provide a time-scale on the term "any amount of time" would be unscientific, that the six week service would have detected the loose hinge in time, thus preventing the frame failure and that the PDI document supplied is a generic list and does not cover all checks. They also stated that Evans Cycles in no way accept that the frame failed due to a manufacturing or set-up fault. My main point of contention with this list of anti-fact that they have provided is, if they are unqualified to comment on the quality of the weld, how can they categorically deny possibility of a manufacturing fault when I have been told by someone who is qualified that it was at fault? I then asked Evans to either refund the money or return the bike so I could pursue a refund via other methods. The have reluctantly agreed to a refund but not without making the pedantic gesture of saying I have to return the bell, lock and trousers that were bought at the same time as the bicycle (with a retail value to them of zero). All through the process, Evans Cycles main priority has been absolving themselves of any liability for the accident at the expense of properly investigating the cause of the accident. They used the possibility of sending the frame to Tern for a full warranty investigation almost as a threat, saying it could take several weeks and their findings may not be so favourable to myself. They have constantly stated that the accident was not due to any assembly fault by themselves when I have never suggested that it was. They also dismissed this thread saying that different models are made with different processes and so the "very small" amount of failures are not related. I have emailed my concerns to Evans Cycles senior management, saying that their staff are not treating this situation with the seriousness that it deserves - putting company reputation before customer safety. Needless to say, this has all been very frustrating and Evans will never get a penny of my money again. I do believe the failure was due to a manufacturing fault, but I also realise that when products are mass produced as cheaply as possible, a certain number will contain faults. The problem arises when the retailer and / or manufacturer refuse to take responsibility of the problem. Here's the link https://www.youtube.com/watch?v=53KugsdIIIs - you need to scroll down to see the reported frame failure. I've no idea if this is a genuine report of not - will await confirmation from this forum. jfx - what a shambles. Have you also considered reporting this to UK Trading Standards? I was really hoping not to read about a Verge failure. I own a Verge P18 (bought in the UK) and have been reading this thread with interest hoping that no verge would be affected. As I bought mine 2nd hand I will presumably have no recourse should my frame snap or even be part of a recall. Can't help feeling though that if there is a problem with those models built for sale in the UK that Tern needs to do something about it sooner rather than later. The silence here is deafening. Tern seems to be completely inative on this thread. However they are very active on facebook at https://www.facebook.com/ternbicycles and twitter at https://twitter.com/ternbicycles . I would encourage people on this forum to post there and bikeforums. Does anyone believe the information on this forum will be online for much longer? The faster the information spreads the better. FYI it is spring, hence more people are biking. I expect more failures to occur unless the press or governments step in. Does anybody know how long it took Tern to investigate the faulty welding for the 2013 recall? I'm sure they did the same thing they are doing now.....no investigation. However the CPSC in the USA does not play games. Hence they had to issue a recall to continue trading in the USA. The welds shown are fillet welds. In their simplest form (and these are simple, just curved) a square ended plate is offered up to the side of another plate and a weld is placed into the corner. The weld melts the parent material slightly (say 1mm for a 6mm fillet weld) but does not cut significantly into the parent metal. The weld therefore is a slightly distorted triangle sitting in the corner. I would not expect a fillet weld to cut significantly into the tube here and if it went halfway through then it would risk burning througn, and the heat stresses and weld distortion could be nasty. I am not therefore worried about lack of penetration but am worried about the fact that the welds in places do not even appear to reach into the corner (clearly visible at the top but cannot see clearly at the bottom). This might be from using a large single pass weld rather than a series of smaller welds to build up the thickness. The problem with this is that the strength of a weld, all other things being equal, is directly proportional to the width of the weld across the weld throat. If we go back to the triangle of weld, the throat is the shortest distance across the weld and is from the square corner to the middle of the long side. If the weld does not reach into the corner then there will be a mm or two reduction in the throat thickness, which is not a problem on a large weld, but taking 2mm off of 8 (say, as a complete guess) would reduce the strength by 25%. As the owner of a brand spanking new X10, who is at the weight limit for the bike, these pictures are giving me nightmares. Thank you akpope. I think what you are saying here is that when a weld is made in a corner where a squared-off tube meets a plate, called a fillet weld, it ought to penetrate as close to the corner as possible, although it is impossible to get into the precise corner point. And that the smaller the weld area, the more significant the gap. This gap was what I was reacting to. I am aware that with TIG welding, it is possible to go over the weld several times, remelting the metal to get it where you need it and add more metal as needed. Of course this adds to the time required to complete the weld, and slows the output of the factory. And production speed is the key to keeping costs competitive. But if the welds are rushed, especially on high stress areas such as right here, we end up with unsafe bikes. This is the classic tug of war between cost vs. safety. 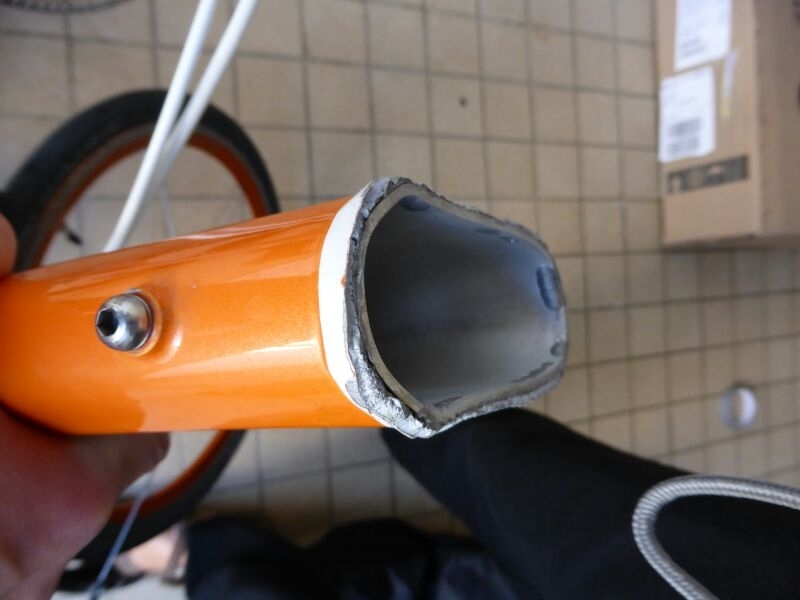 And add to that that aluminum was chosen as the sole material that would be used for all of Tern bicycles, the worst metal when it comes to stress fractures. Pretty, light weight, yes, yes, but much more critical than steel when it comes to the quality of the welds. I think if these bikes had been made of steel, that there would be no failures to date owing to the inherent strength of steel, all else being the same, including sub-par welds. I still hope that this is limited to just a small portion of the production and can be isolated, fixed and resolved. There is one other possibility: that many or most of Tern bikes, being folders, were designed to be folded and stored in RVs, boats, planes, and only occasionally taken out and used. These shall never fail simply because they are hardly ever used. If there were a recall, Tern would have to basically lose the profits from all of these bikes which would never have surfaced with a problem if left alone. You see, there really are two types of people attracted to folding bikes: those who like the fact that they may be made small to fit on recreational vehicles and the like for very occasional use only. Then there are those who like the fact that folding bikes can be folded and taken indoors as theft prevention, and thus are suited to everyday use as commuting bikes, and subjected to all the wear and tear any object used every single day get treated to. This second set is the nightmare team for Tern--where these breaks are originating. Mind you, I am not suggesing that team two is abusing these bikes in any way, it is just that team one is codelling theirs, and this is ideal for any company which wants to make things fast and cheap and not face recalls. So perhaps they are waiting this out and hoping that there are not so many out there which will fail if most are just quietly sitting in cargo holds somewhere. If this is the case, they are handling this wrong: if they really think most will never fail, as they are hardly used, they should really take care of any who do fall victim to these failures, and very aggressively tackle this at the source and make sure there are no more bad welds going out. Short of a recall is to pamper any who suffer as a result. But so far it appears not much like pampering. I am aware that with TIG welding, it is possible to go over the weld several times, remelting the metal to get it where you need it and add more metal as needed. Of course this adds to the time required to complete the weld, and slows the output of the factory. And production speed is the key to keeping costs competitive. But if the welds are rushed, especially on high stress areas such as right here, we end up with unsafe bikes. Multi pass welds are absolutely normal. They do have to be treated carefully because you can get a slag forming on the outside of the early passes, which has to be cleaned off to avoid it becoming included in the weld, but I presume that the IG bit of TIG (In Gas) means that this should be minimised if not completely avoided. Using a large number of thin passes would allow the weld to flow more easily into the corner. I do not know what sort of testing is done by Tern, but non-destructive testing by X-ray etc can be inconclusive and there is no substitute for pulling a percentage of welded frames off of the line and cutting into them. Or alternatively you can design the welds with a larger factor of safety to cover variability in welding. I am 180 miles away from my bike right now, but I seem to recall that the welds on the verge had been specially ground to make them look beautifully "Smooth and swoopy" (my words not Tern's). This has a positive effect for fatigue, since it prevents any sudden changes in the flow of the stresses and hence nasty stress concentrations, but if the triangle of weld is ground so that the long edge becomes concave then the standard throat distance is reduced, increasing the stress and making the lack of penetration into the corner even more critical. I do not know this for certain, but I would expect that a jaggy bit of welding on the inside of the weld would also be a bad fatigue detail and might lead to early failure under light load but many miles of use. I suspect that the failures are caused by fatigue rather than yield. Although Aluminium is not as plastic as steel, i.e. it does not stretch as much before it snaps (1 to 5% elongation compared to 15 to 20% for steel) I would still expect it to be able to tolerate an early failure without snapping but by slowly folding up. Fatigue, however, tends to cause a failure that can propogate quickly around a weld. A sharp ended crack can form which gives a massive stress concentration, and in a relatively brittle material, more energy is released by the joint opening than is absorbed by the tearing apart and the crack can speed through the material. 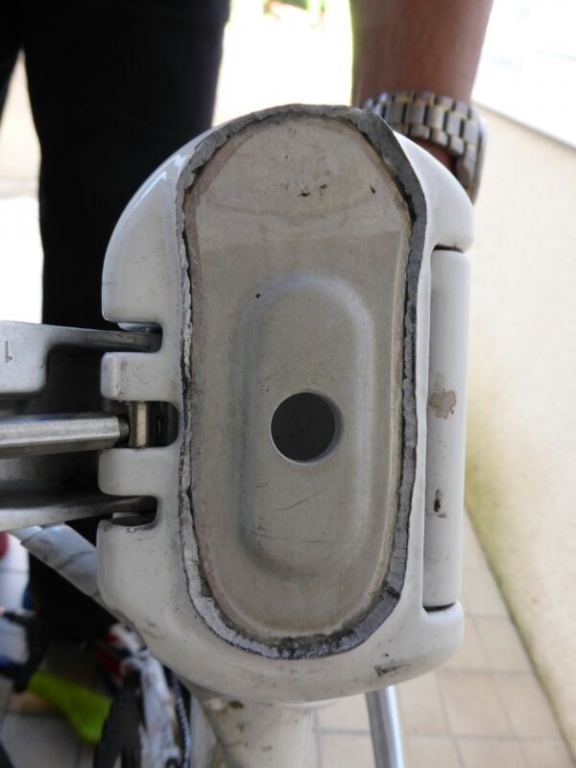 My daughter had my original Dahon Mu P8 and the tube that holds the saddle stem snapped just above the top of the frame in fatigue (those upstands are a phenominally bad design detail) and the crack was a beautiful zig zag failure classic of fatigue in a plate. Unfortunately I had no camera before I got it welded up. I am waiting for load testing instructions to be posted (obviously for strength not fatigue). They might run like "Support the frame at the axle locations rigidly. Ccnstruct suspended platform hanging off of the central frame hinge. Carefully persuade two 350 pound gorillas to sit on platform. Return bike if fails (presuming that gorillas do not get upset and hurt you too badly) otherwise go ride". I obviously need some sleep. I'm from Israel (like the fourth person whose bike fell apart), and as I'm currently in the market for a folding bike to help me through my commute, I would really appreciate some input from a Tern representative on this matter. I don't want to buy a new D8 and then have it recalled, or worse- buy one and then receive a head injury like the guy whose frame broke. Edit (May 23, 2014): Just bought a Dahon Vitesse D8. The Term was a great ride, but not worth risking my safety. Wish I would've gotten to hear from Tern on the matter. Hi Mr Pope you really seem to know your subject. I am actually posting my bike to Evanstoday for them to examine it. However, I have taken some more photos in case it gets damaged in transit. Here are a couple of examples as I thought you might be interested. I would always be careful working off of photos since they can give misleading optical illusions but these seem pretty good. The right hand side of the top picture shows the connection on the underside of the frame. If I am interpreting the pictures correctly, the tube is one colour, the area of weld where it is not broken (i.e. the void in the corner) is a darker colour and the snapped weld area is lighter. 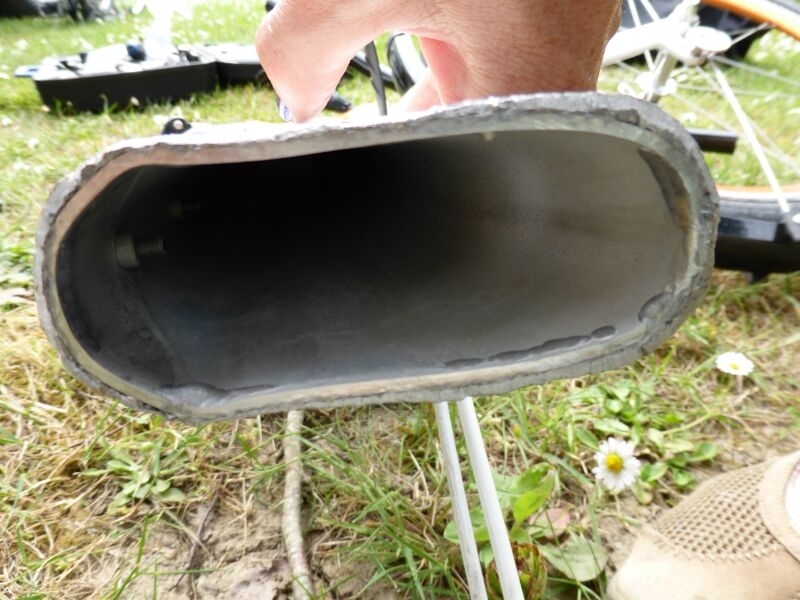 What is interesting is the ratio of snapped weld to what could potentially have been welded (could be as low as 50%) and the size of the weld compared to the tube (probably misleading due to the viewed angle of the weld failure plane) where possibly the areas are the same. Hence if the weld was done as well as possible then it could have been twice as strong. I do not know how strong aluminium welds are (in steel the strength per unit area is slightly stronger than the parent material) but it looks as though the weld MIGHT have been comparable to the tube strength for static load. But for fatigue, I would have liked to see a lot more weld metal than parent metal, and that is clearly not there. BTW as far as knowing my subject, I am a very experienced bridge engineer,which means that I hope to know how much I do not know. I am fairly knowledgeable about steel welding but not an expert. I am, however, well qualified to ask rude questions and expect that they are at least reasonable - it would be nice to get an answer from Tern about the technical questions but I am not holding my breath. Summer Solstice - which year ? ps I do wish that I had set my user name as AdrianPope since being called Mr Pope always seems odd, even though I am 52 years old. Christine, I hope you will get a satisfactory response from Evans. FYI have you seen the recent post on this forum where Evans tried everything to deny responsibility. I hope this won't happen to you but ''forwarned is forearmed''. Will you also be reporting the failure to Trading Standards? Given the lack of communication from Tern, I fear that this kind of action is needed to prompt any response. Best of luck - please keep us posted. I see REI took the Link D8 off their website saying the bike is "sold out or unavailable". Any idea if this is related to the thread topic? I have some direct experience with Tungsten in Gas (aka Wolfram in Gas in some places) welding. It is very difficult to do well. The tungsten electrode on the welding head must be maintained about 2 mm from the surfaces being welded BUT must not touch the surfaces, WHILE the filler rod (needed for the type of weld done on the maintube/joint plate) is advanced into the plasma arc between the electrode and the surface and WHILE the head and filler rod are advanced along the weld path. I trust Tern have retained a metallurgist to determine any dross content in the weld bead and to determine if the weld bead crystal structure discloses anything. A contibuting factor could be bad filler rods, even if technique is the major factor. Thanks for your contribution. Do you know how long it should take to investigate faulty welds? It's now nearly 6 months since breakages were reported, plus the recalls from 2013. Just in: It appears that Tern is now moderating the thread. My last post was put into 'a queue for moderation'. It will be interesting to see whether this post appears. If your post contained (more than a certain number of?) links, moderation is normal; it's been that way for quite a while. I have experienced this in the past. As much as I and everyone else would like to see some form of official response on this thread, it is abundantly clear that it will not be forced out by badgering the manufacturer. I choose to wait, though not with bated breath; I recommend you do likewise. Steve, How long do you suggest we wait? It's now almost 6 months. Agreed, badgering the manufacturer has achieved nothing. The only sign of any action is that they've made this forum private. Basically, I would like to know if my bike is safe to ride. I don't think that is unreasonable. Nobody has answered any previous questions - how long should it take to investigate faulty welds, how long did it take before the 2013 recall? I actually think we need a wider campaign, Facebook, etc, to provoke a response. Steve, what is the implication of your post? Tern isn't bothering to investigate (I hope this is not the case), they will never make any findings public? Something else?